The Optical Shop - Essilor Promotions! The Optical Shop at the Williamson Allemond Regional Eye Center is proud to announce our partnership with Essilor Labs! Essilor Labs is the company who developed the Varilux, Progressive Lens, and well as the Crizal, Anti-Reflective Lenses. We are very excited about this new affiliation, and because of this strategic move, it will allow us to offer a broader selection of products with cutting-edge technology for our patients and customers. Our clients will benefit from having access to these superior optical products, and the timing was perfect for us to get on board with Essilor just as well. Essilor is in the middle of their POWER OF 3X Promotion allowing each of our patients to earn up to $90 in rebates just for buying products they would already have purchased! Patients can still get credit toward the rebates even if they use insurance to help pay for their order(s). The program is active all summer long and will continue through September 30, 2015. *Read Below For More Information On The Essilor Products That Are Eligible For The Rebate! If I had to pick a product that I would say helps me the most each and every day, it would be the Crizal, No Glare, hands down! It helps me with eye fatigue on my computer, and it improves my vision for night driving and dealing with those crazy new head lights you have to deal with these days! Most of all, I love the fact people can see my eyes and not the glare of my lens. These new Crizal Lenses resist smudges, repels water and dust, and protects my eyes from harmful UV rays too. I have to be honest, as with any set of glasses, you still have to clean them when they get dirty or wet, but all you need is a clean, soft cloth for this. We give these out to our customers with the purchase of new glasses anyways, so you will have one on hand for these occasions and predicaments. I really love my Crizal Lenses, and it is hard to remember what life was like before them. If you decide to have your lenses made with Crizal Lenses, You get $10 in rebate money back! So for those of us who have reached that progressive lens age, Varilux Progressive Lenses will get you the next $10 in rebate money. Varilux Lenses have several choices to choose from depending of your lifestyle needs. One of our Opticians will help you with your selection and make it an easy and painless process for you. We prefer to use W.A.V.E. Technology Lenses. These lenses allow you to get sharper vision, reduce swim and distortion in the lens. They also improve contrast so fine details are more distinct. Are you interested in prescription sunglasses? If you add the Transitions Signature VII to your lenses as well, your lenses will darken when you go outside! The newest Transition Lenses are up to 40% darker than most competitive brands and clears up better indoors than ever before. Adding this feature gets you another $10 back in rebate money. In order to get the full $90 back in rebates from Essilor you would need to purchase a 2nd pair with Xperio UV Polarized Lenses, Varilux and Crizal. You can find the full requirements for the Essilor promotional rebates at www.powerof3x.com/rebates. 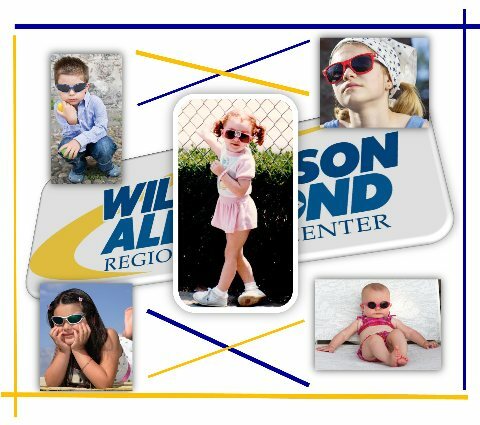 The Optical Shop at the Williamson Allemond Regional Eye Center is very excited to pass the promotional opportunities to our patients and customers! We look forward to meeting with you and discussing your eyeglass needs. I was long overdue for an eye exam, so I made an appointment at the Williamson Allemond Regional Eye Center in Zachary, Louisiana. What I didn't know was that my doctor could also recommend eye lid surgery. I had the same droopy eye lids as my dad did which made it look as though I was constantly squinting and tired. I never realized just how much it affected what I could and could not see either. I had often considered having my eye lids fixed, but thought it might be a bit vain, so I was hesitant. During my eye exam, the doctor informed me that I would be a perfect candidate for the surgery. He also suggested I not purchase new glasses until after the surgery, if I decided to have the procedure. That day, I met with the surgery coordinator to discuss everything involved with the procedure. She explained everything in great detail. She gave me instructions on what to do before and after the surgery. She told me how the surgery is performed and what to realistically expect as well. She took her time explaining the process, and she answered every question I had. I left her office that day feeling so comfortable, and I decided to have the surgery. Everything went just as I was informed, and the results far exceeded my expectations. I can see so much more area in my vision field now! I can see up, down and in my peripheral areas too! I now wear sunglasses because my eyes are open again letting in more light. Being a bit subjective, my eyes do not look tired anymore, and I've received many compliments about looking younger as well. For those men considering this surgery, do not let the idea of being vain enter your decision process. I am very pleased with the outcome. I did not realize just how much of the world I was not seeing. My only regret is not having the surgery done sooner. I'll ‘see’ you soon! Do You Have Drooping Eyelids That Affect Your Field Of Vision? Is The Skin Around Your Eyes Sagging Making You Look Tired Or Upset? Call Today And Make Your Appointment! The Optical Shop - Summer Sunglasses Sale! In a recent Blog article, Dr. Jason Allemond spoke about the dangers of harmful UV rays to our eyes. In follow up to this, I wanted to take a few minutes to tell you about what we have to offer in The Optical Shop that can protect your vision as well as keep you up to date in all the latest style fashions. 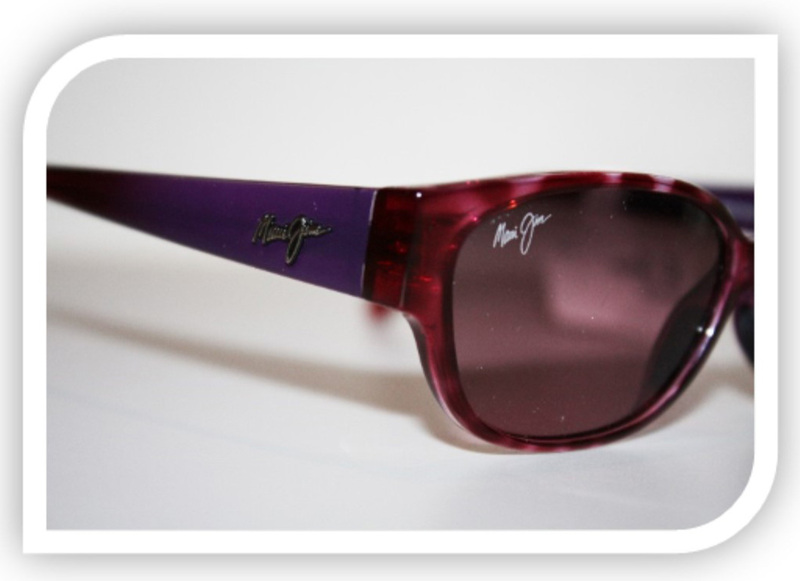 Let us get started with Maui Jim. Maui Jim wipes out 99.9 % of glare and blocks 100% of the harmful UV. There are 9 layers of protection to Maui Jim lenses. Maui Jim uses rare earth elements where, instead of dimming the light, they use the natural light to enhance color and clarity. The lenses are polarized to eliminate reflected glare from any flat or shiny surface. Some other features I love in these lenses are the waterproof and oleophobic coating. It helps repel oil from skin and water and makes the lens easier to clean. They also include a no glare on the back to help eliminate eye fatigue and a scratch resistance to protect the life of the lens. The last feature of the lens is a mirror on the front surface of the lens to help with overhead glare and “squints”. Our Opticians can help you choose the best lens color for your favorite outdoor activities. Now for the frames, as you can see from the picture below, Maui Jim uses color if you are looking for something a little more fashion forward. They are also available in basic tortoise and black if you want to keep it simple as well. Our Opticians in The Optical Shop are not afraid to help you with the right choice. It is our pleasure to serve our customers. They come first. Now let’s explore the brand Costa Del Mar. Costa Del Mar has taken a different direction than Maui Jim. They have three lens types to choose from. All three wipe out 99.9 % of glare and blocks 100% of the harmful UV. The top lens in Costa is the 580G. It’s a lightweight glass lens. The clarity in this lens in unbelievable. It’s 20% thinner and 22% lighter than average polarized glass. These lenses reduce haze and blur while enhancing color definition and unmatched clarity. You can order the lenses with or without mirror on the front and with or without no glare on the back. For those who prefer a little less weight they offer the 580P it is an impact and scratch resistant lens. You can still get all the bells and whistles of the 580G. The last lens they offer is the 400G. This lens is still as lightweight as the 580G but the clarity and sharpness of colors are reduced in this lens. All of these lenses are loved by fisherman. They have such a variety of mirrors and lens colors to choose from. Our Opticians will help you choose just the right kind that fits your lifestyle needs. As far as the frame, you can see we like to have fun from our picture below. Costa Del Mar has several frames available in camo and several other camo colors. Costa Del Mar is definitely not afraid to use colors like purple and blue, but they also have your basic colors such as black or brown for those of you who are more conservative. Our Opticians are the best, and they will help you get the best protection for your eyes while looking good in the process! Last and definitely not least, is the well-known brand of sunglasses, Rayban! Rayban is more for the fashion forward people out there! They do offer UV protected lenses and in some cases polarized lenses! Rayban even offers mirrored lenses as well. Rayban puts a lot their work into the fashion of their frames. They are not afraid of the something different as you can tell from the picture below. They call these sunglasses a Denim Wayfarer. These frames are a lot of fun, and our customers love them! Rayban has many styles, pretty much any color, and they come in all sorts of shapes and sizes! Come by check them out! 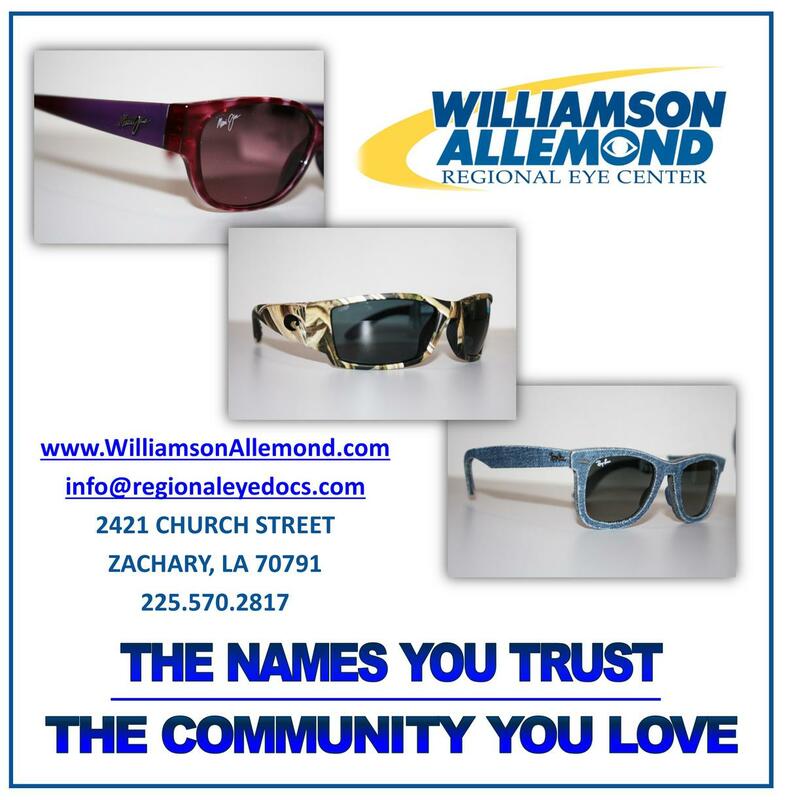 Come browse The Optical Shop at the Williamson Allemond Regional Eye Center in Zachary, Louisiana! These three examples are our hottest selling items this summer, but these are just a few samples of the lines we carry. Come see all we have to offer. Come in and see your favorite Optician today! Let them help you make a selection that will keep you in the latest style and fashion, while protecting your vision at the same time! During cataract surgery the eye’s natural lens is replaced with an artificial lens implant. This new artificial lens provides better vision by eliminating the cloudiness produced by the cataract. Another benefit of the lens replacement is the ability to reduce one’s dependence on glasses. There are now advanced technology lens implants available which are capable of eliminating nearsightedness, farsightedness and astigmatism. It is even possible to reduce the need for reading glasses with a type of lens implant called a multifocal. If you or a loved one has cataracts, call for your appointment today so you can discuss your options with one of our Ophthalmologists at the Williamson Allemond Regional Eye Center. We look forward to meeting you! 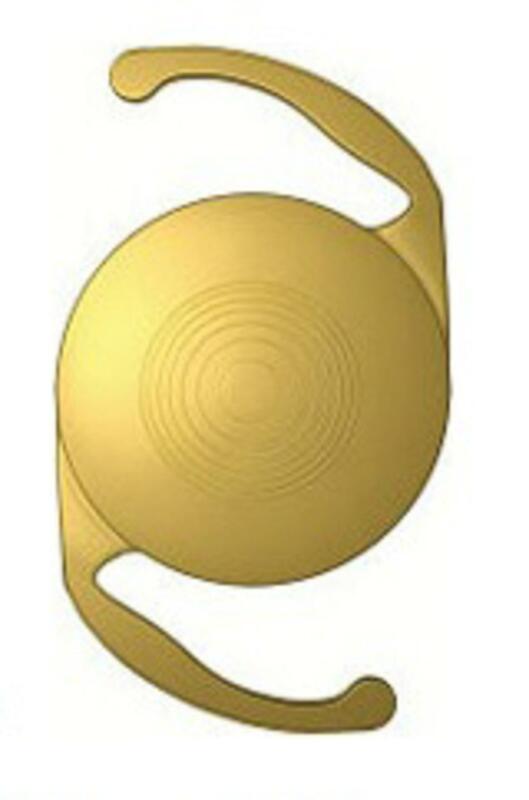 Take Our Free Survey To See If You Are A Candidate For Advanced Technology Lens Implants! About Our Advanced Technology Lens Implants As Well! IT'S SUMMER TIME, PROTECT YOUR EYES!! IT’S SUMMERTIME, PROTECT YOUR EYES! By Jason P. Allemond, O.D. During the summer months in Louisiana, you are never completely dressed without your sunglasses as part of your outfit! Extended exposure to the sun’s harmful ultraviolet (UV) rays has been connected to cataract formation, pinguecula, pterygia, and macular degeneration. New studies show that the sun’s emittance of high-energy blue light can also cause retinal damage in certain populations. There are 3 categories of UV light. These are UVC, UVB, and UVA. The ozone layer absorbs most UVC rays so very little of these harmful rays reach the earth’s surface. UVB rays do reach the earth’s surface and these are the wavelengths of UV light that can cause sunburns, and it can cause growths on the surface of the eye called pinguecula, and pterygia. UVA rays are weaker than UVB rays, but they penetrate the cornea and can cause cataracts and retinal problems such as macular degeneration. To protect your eyes from the sun’s harmful rays, one should always wear quality sunglasses that block 100% of UV rays and absorb most high energy blue rays. Your choice of glasses frames should be a close fitting, wrap around style that eliminates ambient light from sneaking in around the edges of your frames. Remember, color or the darkness of lens does not reflect how much UV energy the lenses will block. In fact, most people don’t know this, but UV protection can be put on clear lenses just as well. Sunglasses are not just for adults, children are just as susceptible to the sun’s harmful rays too. Kids typically spend more time outdoors and their ocular surface is clearer, which allows for deeper penetration of these harmful rays. Please don’t neglect the health of your eyes this summer, and be sure to wear your sunglasses! Please be sure not to neglect your children’s eye health either! Come by our Optical Shop, and one of our Opticians can help you with the right selection for you and your family! Cataracts can develop to the point that one’s vision is severely limited and is affecting quality of life. At this stage, the best option is to remove the cataract with surgery. Cataract surgery is a 15-20 minute outpatient surgical procedure in which the cloudy natural lens is removed through a tiny incision and replaced with an artificial lens implant. The procedure is not painful and recovery is quick. Most people undergoing this procedure are able to return to their regular activities within a few days. This procedure can be performed in our outpatient surgical center here in Zachary without the need for hospitalization. Click Here For An Informative Video About Cataract Surgery! Cataracts are a common eye problem and one of the leading causes of decreased vision. A cataract is a clouding of the lens within the eye. This clouding occurs in most cases as a normal part of the aging process but can also be caused by certain medications or diseases such as diabetes. Cataracts generally worsen gradually over time and can eventually reach the point where vision is quite limited. Some of the most common symptoms of cataracts include blurry or cloudy vision, problems with glare and increased light sensitivity, and difficulty with seeing at night. Fortunately, cataracts can be treated with an outpatient surgical procedure once they become symptomatic. Are you or one of your loved ones having these symptoms?